NEW YORK (August 28, 2017) – FlightSafety International announces that S7 Airlines of Russia has ordered a full flight simulator for the Embraer E170 aircraft. 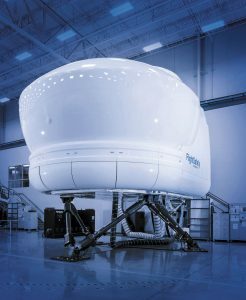 The new FlightSafety FS1000 simulator is scheduled to enter service at the S7 Airlines training facility located at the Moscow Domodedovo airport in Russia late next year. “We continue to expand the S7 Airlines’ fleet with our plan to add 17 Embraer E170 aircraft. Acquiring a FlightSafety International full flight simulator will give our pilots the opportunity to train in Russia under the supervision of experienced instructors at the S7 Training Center, the largest in Eastern Europe. The simulator will be equipped with an advanced visual system that brings flights as close as possible to real conditions. The instructor station provides tools to recreate any condition and to help pilots master all the skills required,” said Vladimir Obyedkov, CEO of S7 Airlines. The advanced technology systems incorporated into the FlightSafety FS1000 simulator being built for S7 Airlines are designed to enhance performance, increase availability, and lower life cycle costs compared to previous-generation devices. They include FlightSafety’s, electric motion control and cueing, and a new multi-function Instructor Operating Station that features an intuitive interface, scalable graphics, and large multi touch displays. S7 Airlines operates a fleet of 72 aircraft. The airline operates flights to some 100 destinations in 28 countries throughout Europe, the Middle East and Asia, with an extensive network in the Commonwealth of Independent States.